England rounded off their international summer with a thrilling three-run victory over India in their one-off Twenty20 international at Edgbaston. The match went to the final ball but India captain Mahendra Dhoni failed to hit the six that would have won it. 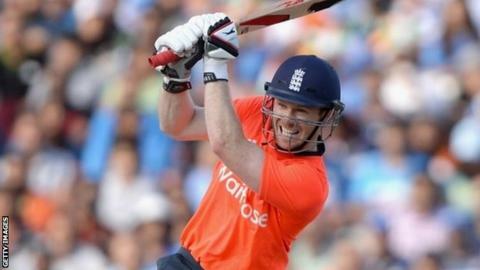 A blistering 71 off 31 balls from captain Eoin Morgan had lifted the hosts to an imposing total of 180-7. Virat Kohli put India on course with 66 but fine death bowling by Harry Gurney and Chris Woakes sealed England's win. With 26 runs required from the last two overs and expert finisher Dhoni at the crease, India appeared favourites. But Gurney, playing only his second T20 international, bowled a tight penultimate over to restrict the tourists to nine. Dhoni smashed the first delivery of Woakes's final over for six only to turn down two singles. It left India needing five from the final ball for victory or four to force a Super Over. When the skipper picked out Moeen Ali at deep square leg, England were able to celebrate a nail-biting victory to the disappointment of the vast swathes of India fans in the stands. "We got a very good score, but felt India would be hard to stop," said Morgan. "Woakes, Finn and Gurney held their nerve - they were exceptional. "India get a lot of support up here, but hopefully the home fans are going home happy. "I've gone through tough times, but always come out on the right side. The belief was there." "It was a good performance. Eoin Morgan led from the front. It took a pretty special innings from him to get England to 180. There was nothing really riding on this game, other than it being an international fixture, so it was important to give the young players experience - Chris Woakes came through it against one of the best players in the world, and you should learn from every one of those experiences." The riveting contest marked the end of a tour in which England fought back from 1-0 down to win the Test series 3-1 but were then heavily beaten by the same scoreline in the one-day series. England were indebted to Morgan, whose return to form after a disappointing one-day series will have delighted coach Peter Moores as he plans towards the Sri Lanka one-day tour in November and December, and next year's World Cup. The Dublin-born left-hander smashed seven sixes and three fours as England pummelled 81 runs from their final five overs. Morgan's knock reinvigorated an England innings that was in danger of stalling when Joe Root was out for 26 to leave the hosts on 85-4 in the 12th over. Surrey opener Jason Roy nonchalantly reverse swept his second ball in international cricket for four but could only manage another four runs before pushing Mohammed Shami to Ajinkya Rahane at cover. Moeen Ali fell for a duck, Alex Hales was brilliantly caught by Rahane for 40 and Root lashed debutant spinner Karn Sharm to deep midwicket for 29. Jos Buttler lacked his characteristic fluency as he laboured to 10 off 15 balls, but Ravi Bopara (21 not out) teamed up with Morgan to fire England to an imposing score. India overcame the early loss of Ajinkya Rahane - bowled round his legs by Moeen - with a partnership of 79 between Kohli and Shikhar Dhawan (33). Kohli struck nine fours and a six in his first half-century of a difficult summer, but after Dhawan had been bowled by Woakes, he holed out to boost England's chances. Suresh Raina was bowled by a Gurney yorker for 25 and Ravindra Jadeja ran himself out for seven. That left Dhoni as India's best hope - but for once even he could not drive his team over the line. "I missed two balls that I could have hit over the boundary, but hitting 17 in the last over is difficult," said Dhoni. "It was a good chase, 180 is a tricky score in T20 cricket. We gave away too many runs at the death, but bowled well in the middle overs. "Overall, it's been a good tour for us. The atmosphere in the dressing room has been good."